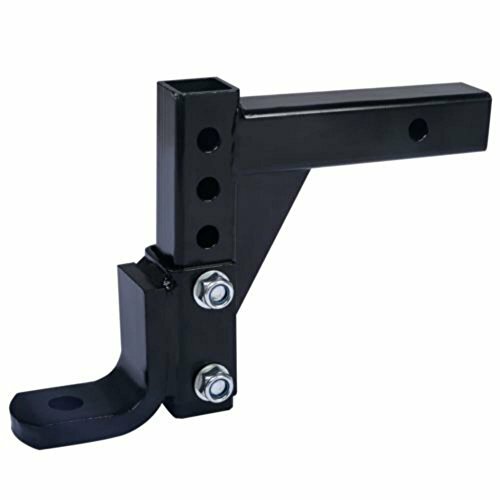 Specifications Color: black Material: steel Weight: 14lbs Overall length: 15.5" Receiver size: 2" Height adjustment: 4.5"-10"
This 10" adjustable trailer hitch is made from high quality durable steel which has maximum load of 6000lbs! With 4-level adjustable heights it's perfect for almost anywhere which needs towing for example your boat or trailer. Long service life now is at a great price. The hole size for the ball shank 26mm,BALL OF 1-7/8" 2"　2-5/16"will work on this receiver!